controlled using just wireless mouse. These images show the parts of the system. 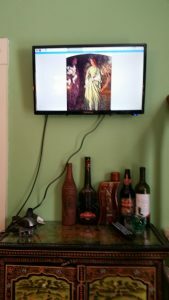 The RaspPi is actually mounted just below the TV and behind the mounting OR in the wall behind the TV, depends on what is easiest and looks best. 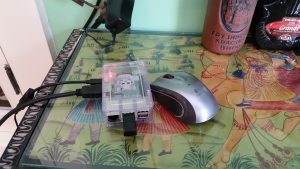 Standard mouse – USB connection, $10 and up. The Samsung Frame is a high end, 4K tv in a picture frame mount. It is an art device, similar to others, in that it has a tightly curated art selection, a paid service or your own photos. Since it is a Samsung Smart TV, it can run any aps from the Samsung library. Since the Smart TV is basically an android, some Android aps. Step into the Metropolitan Museum of Art, the Tate galleries, or Taiwan’s National Palace Museum from your sofa. Everyone’s favourite gallery is different. Some people like to peruse cubist sculptures in large minimalist rooms, others like to take in impressionist brushwork under the bows of classical architecture.Now though, you can access some of the world best galleries from the comfort of your own living room, as Sotheby’s steps into the digital age. The network is basically many short-ish videos from various galleries in major museums — not just images of art, so some good some bad news as to how useful. 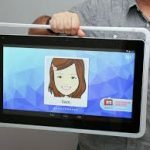 Nabi Big Tab is a 24 inch screen tablet for under $400. The screen is mounted on a standup frame, that is on the heavy side, that still is mountable on a wall. 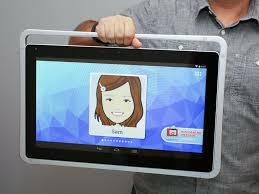 The Big Tab runs a kid friendly Android that can be unlocked into Mommy mode for running standard Android aps. The downsides we are still exploring are: (1) it always starts in kid mode, (2) how to tag aps to run in Kids mode, (3) how to disable the wake up on local activities. None of these are an issue for a public space, they are annoying when used at home. There is also some question as to production availability – you need to go to NABI to determine current production. electricobjects.com is coming on strong with a 23″ screen, for $500. Is the Timing Finally Right for Framed Digital Art? Posted on May 18, 2015 May 19, 2015 Categories Devices and hardwareLeave a comment on Is the Timing Finally Right for Framed Digital Art? Once you have decided you want to show art work on your tv, once easy source is our WeLoveMuseums Digital Virtual Museum. Go over to the WLM @ Home, sign up and select your image categories or artists. There are over 10,000 images of art from ancient Egypt to recent times divided into 300 categories. Once you have created your profile, there is guidance for how to tie the image display to your device of choice. How connect computer to TV display ? Chromecast sw does not actually broadcast the whole screen, it requires enabled aps – a browser or youtube are the best for computers, the browser has a full-screen mode. Posted on February 19, 2015 February 19, 2015 Categories Devices and hardwareLeave a comment on How connect computer to TV display ? Watching TED on TV is a good approach to explore all the interesting content to be found there — here is a discussion about it.